The latest collection of new Holmes stories published by MX to help preserve the former home of Sir Arthur Conan Doyle. Released concurrently with Part XI. Part XII: 1894-1902 features contributions from C.H. Dye, David Marcum, Thomas Fortenberry, Daniel D. Victor, Nik Morton, Craig Janacek, S. Subramanian, Jim French, Robert Stapleton, Nick Cardillo, Paul D. Gilbert, Mike Hogan, Derrick Belanger, John Linwood Grant, Mark Mower, Jane Rubino, and Arthur Hall, and a poem by "Anon." 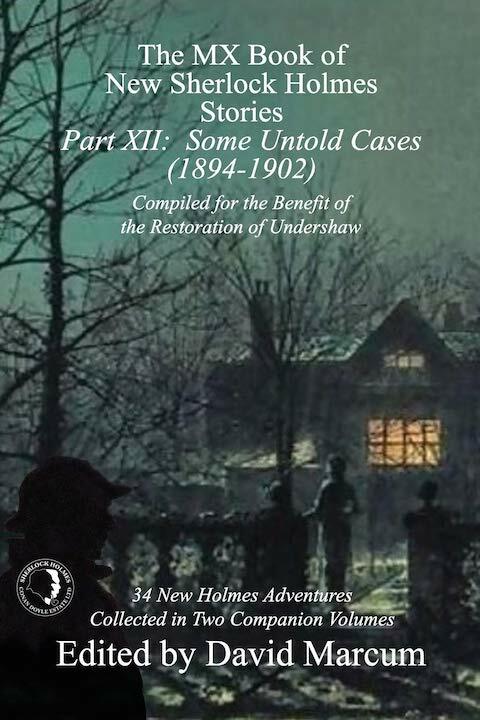 34 new traditional Holmes adventures in two simultaneously published volumes. Join us as we return to Baker Street and discover more authentic adventures of Sherlock Holmes, described by the estimable Dr. Watson as "the best and wisest . . . whom I have ever known."